This week we hosted our first Advertising All-Dayer – where we bring all three year groups together and giving them a brief by visitors from industry. 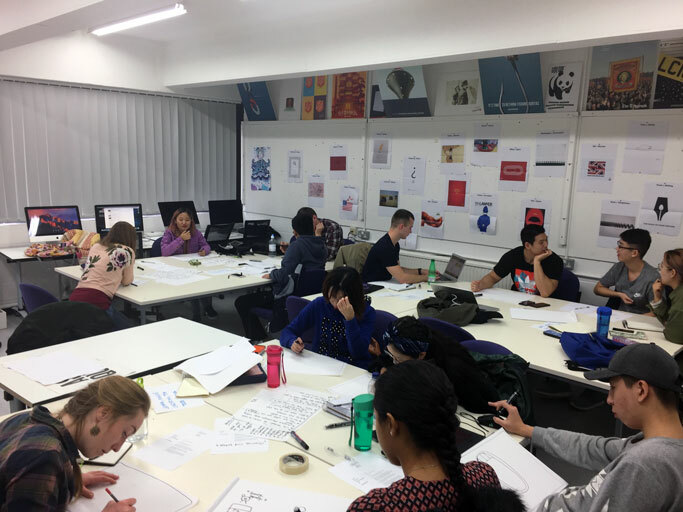 The students are then split into teams and given 6 hours to solve it before coming back together for a group crit led by the professional creative team. It’s something we’ve been wanting to do on the course for a while after a very successful project last year in the offices of BJL. Our advertising course is a specialism and one of the benefits of having smaller year groups is the ability to bring the years together for a bit of peer learning. 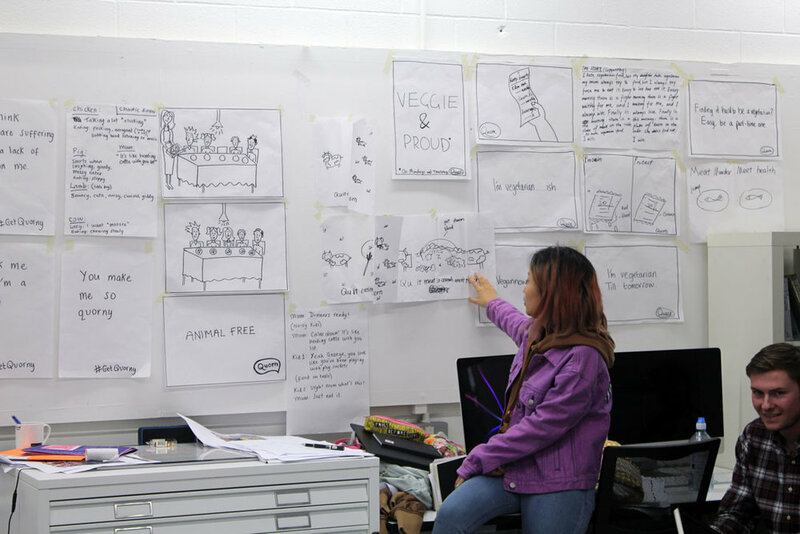 It gives students who wouldn’t ordinarily mix the chance to work together and learn from each other, as well as giving them the opportunity to work directly with professionals in an environment very similar to a working advertising practice. Also, coming as it does about six weeks into the term it was good time for the students to do something a little different and was a welcome change of pace – though I’m not sure many expected that pace to be far faster and intense than anything they’ve done so far! The day began at 10am with the briefing and was led by the award-winning freelance creative team Hayley Parle and Amy Berriman. They set a challenge based on one of their previous projects for Quorn that aimed to encourage families to go meat-free twice a week. The brief was brilliant in that it had a broad scope that encouraged students to think across media platforms and strategic approaches, yet was concerned with an unfashionable brand for which the students were not the target audience and without a heritage of great ads behind it – giving them a clean slate to explore things like the tone of voice, persuasion and brand positioning. They then had till 3.30pm to produce as many scamped ideas as possible with the help of Hayley & Amy and the teaching staff, who floated between teams all day to advise and discuss their ideas as they happened. So how did it go? Well, our visitors were very impressed with the work ethic on show during the day, and with the quantity and quality of solutions pinned up when we all came together for the group critique. In six hours the teams were able to pretty much wallpaper the studio in layout scamps (which at least been a they can probably make a living as decorators if advertising doesn’t work out). Each team was able to talk through their solutions eloquently and with confidence and it was very evident that they’d taken advantage of the different interests, experience levels and skills within each team. The sheer variety of work on show was also impressive, with campaign and one-shot ideas ranging from poster and press elections to scripts and storyboards for TV and radio. It was also interesting to observe the students during the day and to see that the smaller groups were more efficient in producing the larger quantity of ideas than the larger ones, illustrating that while there are a huge benefits to working in teams, too many cooks can have a detrimental effect. The real benefit for me though was the students learning that working at this sort of pace and intensity is not only possible, but also a great way to kickstart the thought process. Often they can spend weeks on a project to get to this stage but outside of academia this kind of time is a luxury and sometimes even a curse – we’ve all had that job that we probably spent too much time on). This is especially important for th final year. With the D&AD new blood briefs just around the corner and the degree show coming into view on the horizon it’s important to realise you have the ability to analyse a brief quickly and in just six hours can create a LOT of ideas that are ripe for development into well considered, high quality campaigns. Indeed, those taking part are now encouraged to take what they’ve done and progress it into fully formed portfolio pieces if they wish - I for one am really looking forward to see what these starting points become.